Introducing the latest innovation from Kinetico. 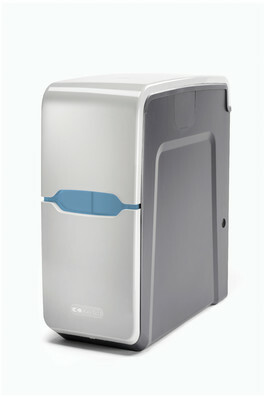 The Premier compact water softener. Small in size. Huge in performance. The Premier Compact regenerates only when necessary, so it won't waste water or salt. Since it has twin softening cylinders, it can regenerate at any time of the day and continue to provide you with clean, soft water. It will automatically compensate for any extra water demands. There are no clocks or timers to set, just remember to keep the unit topped up with Block Salt and the Premier Compact will do the rest. The unit comes ready for DIY installation with full instructions. The Premier Compact also has full Kinetico 10 year parts warranty as standard. It has e-max technology making it 7% more efffiecient than the old 2020c and Quiet Drive. HF - for hi flow rate systems such as combi boilers and unvented systems. TELL US IN THE NOTES SECTION AS YOU PLACE YOUR ORDER WHICH TYPE OF SYSTEM YOU HAVE SO WE CAN SUPPLY THE CORRECT UNIT FOR YOUR NEEDS.